Joost's Dev Blog: Awesomenauts announced! Last week we have announced Awesomenauts, our new game at Ronimo Games! It is an online multiplayer game for PSN and XBLA. 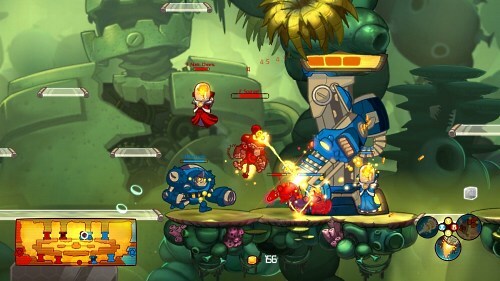 The gameplay combines MOBA with platforming. Most people don't seem to know about that genre yet, but MOBA means Multiplayer Online Battle Arena. It is the term used to describe games like Defence of the Ancients (DotA), League of Legends (LoL) and Monday Night Combat. 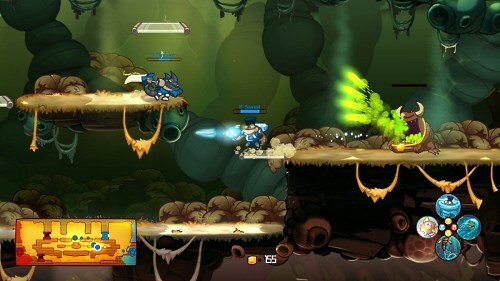 Only Awesomenauts is a platformer, so that makes it quite different in many ways. I don't have time yet to get back to regular posting on this blog, but we have been working on Awesomenauts for quite a while now and it is going to be really awesome (hence the name), so I felt like sharing this with you! 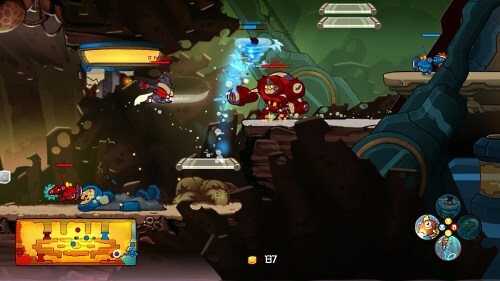 :) Also, Awesomenauts features lots of interesting concepts and technology, especially on the engine and tools side, so you can expect a load of posts here on this blog later this year. Our multiplatform 2D engine, the RoniTech, is now at version 2 and has finally grown mature with this game! Ow, and for those wondering: I am doing some final bugfixes on Proun and will indeed release it in Spring! So that means June 20th at the latest! I haven't decided on the exact release date yet, but you can expect it within a month! Woot! New game announcement and a Proun release? Awesomeness! Any chance for Awesomenauts on PC? Maybe later, we haven't announced anything on that yet.